Population growth in Squamish is outpacing the provincial average, and increasing development pressure on coastal areas highlights the need for a coordinated approach to track and manage growth. Potential cumulative impacts to the marine environment are largely unstudied. The word around the Sound is that there are more coastal development applications and proposals than ever. Does this perception have any basis in reality? As the population increases is the rate of residential development increasing (i.e., the size or number of housing proposals)? Is shoreline modification increasing? Looking at some metrics of coastal development will help to answer these questions. Three large residential proposals (1,000 or more dwelling units each) are under consideration in Howe Sound. One simple metric, although it won’t tell the whole story, is shoreline modification. 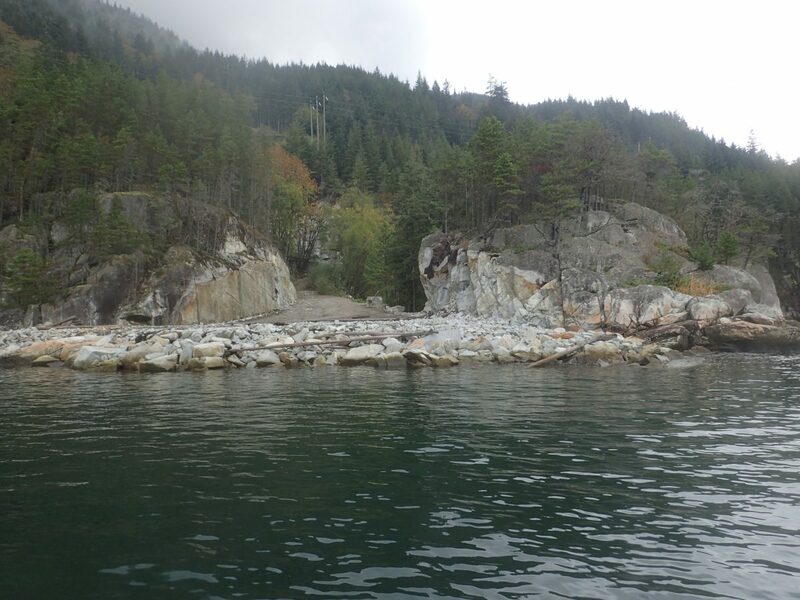 Twelve percent of Howe Sound’s shoreline had been modified by 2014, up from 9.25 percent in 1996 (Figure 1). 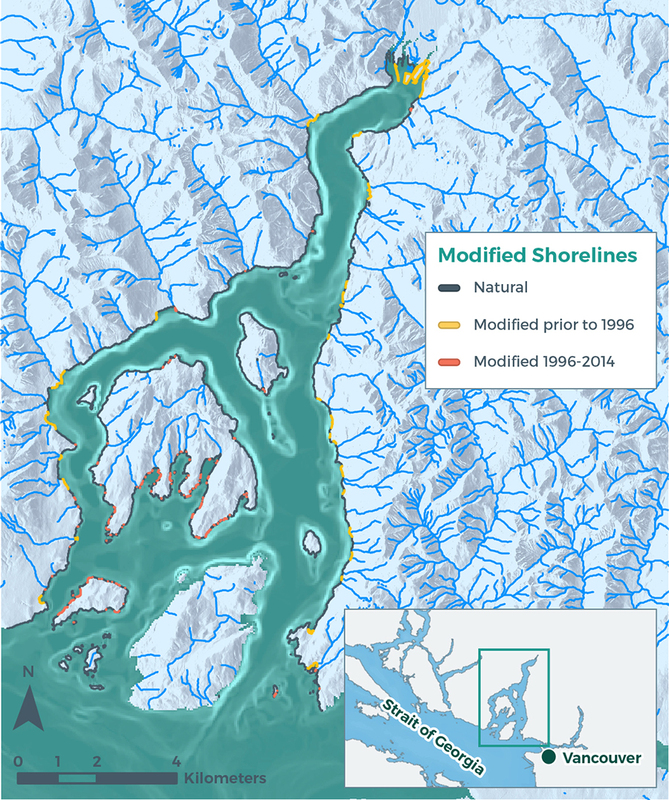 By comparison, approximately half of Burrard Inlet’s shoreline was classified as altered, or not natural, in 2005, up from 27 percent in the 1930s. In general, the greater the coastline alteration and modification, the more the natural processes and ecosystem function are interrupted and the less productive and resilient the ecosystem becomes. Population change by census subdivision, 2006 – 2011. Figure 1. Natural and modified shorelines (2014), modified before and after 1996. No data available for Bowen Island due to cloud cover in satellite imagery. Population in the District of Squamish is growing at 15 percent annually—making it one of the fastest growing regions in Canada. Coastal development is development involving some human-made structure(s) along the coastline. Development can be industrial, commercial, community or residential. There is no worldwide standard that tells us what distance from the coast is considered coastal development, but in this article we focus on development with a shoreline component. At any scale, coastal development is important to plan for because it comes with benefits and with environmental impacts. Squamish people moved about during the year to different fishing and hunting areas, so they needed shelter that could be taken down and reassembled easily somewhere else. Accordingly, they constructed portable Tl’aḵtáxen Lam (longhouses), in which everything could be dismantled but for the frames. When moved, pieces of the longhouses were balanced carefully and lashed with rope across the bows of pairs of cedar canoes that plied the waters of Georgia Strait and Howe Sound. – content reproduced with permission from “Where Rivers, Mountains, and People Meet”, Squamish Líl’wat Cultural Centre. Population pressures drive residential development which results in population growth. Populations in the region are increasing with British Columbia growing at seven percent (2006-2011) and greater Vancouver (the Regional District) growing at eight percent (2006-2011). 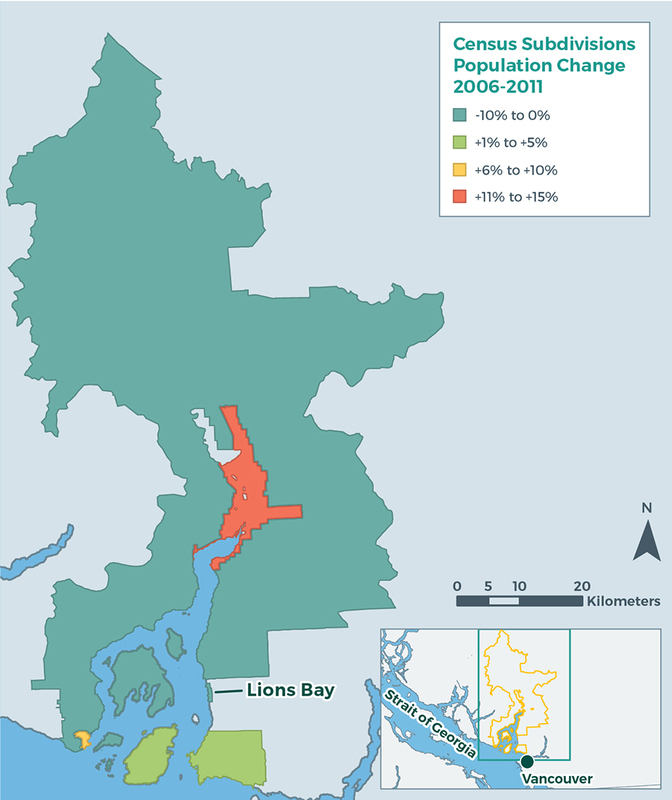 Combining all the census subdivisions of Howe Sound, the overall area grew at a rate of four percent between 2006 and 2011, with District of Squamish seeing the highest growth rate of 15 percent and the largely rural districts seeing small declines. 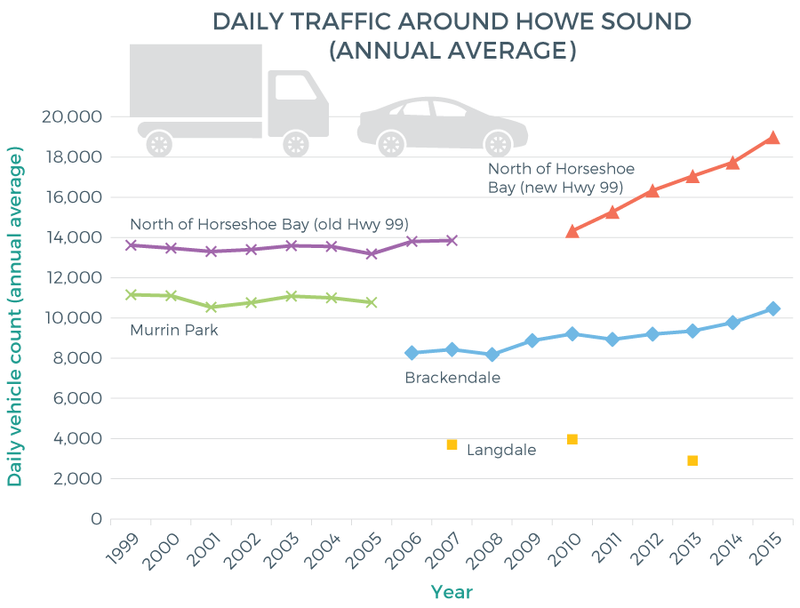 The pace of growth and movement to the area is further documented in traffic data, which show that average daily vehicle counts along the sea-to-sky highway have increased 39 percent between 1999 and 2015 (Figure 3). Traffic volume was relatively stable until the 2010 Olympics and has increased steadily since then. Further, the rate of increase at Brakendale is less than that north of Horseshoe Bay suggesting that most of the increase is south of Brackendale. Traffic at Langdale does not show a similar increase (Figure 3). Daily vehicle counts along the sea-to-sky highway increased by 39 percent between 1999 and 2015. Coastal development can also be quantified by studying foreshore land use according to Land Act Tenures, or Crown land dispositions that are issued for specific purposes and periods of time under an agreement between an individual or company and the provincial government for an interest in Crown land, because the foreshore is owned by the Province. The percent of Howe Sound coastline that is “tenured” is approximately 13.4 percent and a further 2.2 percent was subject to a tenure application as of January 2016. The permitted purpose of tenures varies and currently about nine percent of the coastline is designated for commercial and industrial use, while less than one percent is residential (Table 1). Individuals, developers and industry can follow, promote, develop, discuss and share best practices (e.g., Green Marine certification, GreenShores approaches for shoreline development). Collate and make available pre-proposal data from environmental and social research. Prioritize studies to further understand the effect of shoreline development on marine circulation patterns, shading, biodiversity, erosion, habitat degradation, seafood production, pollution and contaminants. Develop and promote an inventory of best practices for developers and update it regularly. Apply new and proven methods to assess development projects. For example, innovative tools to provide decision support for complex planning problems are becoming more available and more accepted. 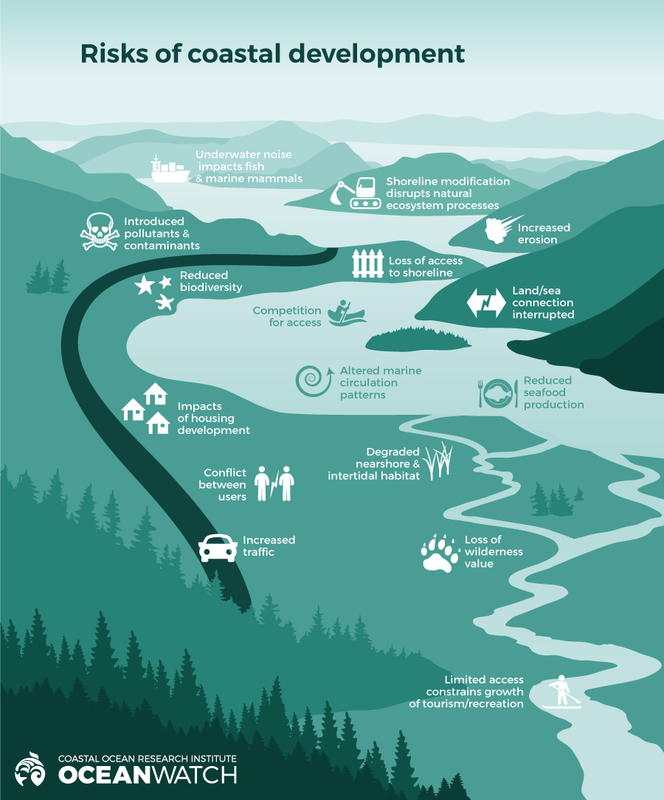 Taking ecosystem service values into account when evaluating the trade-offs of proposed development is one way to proceed. 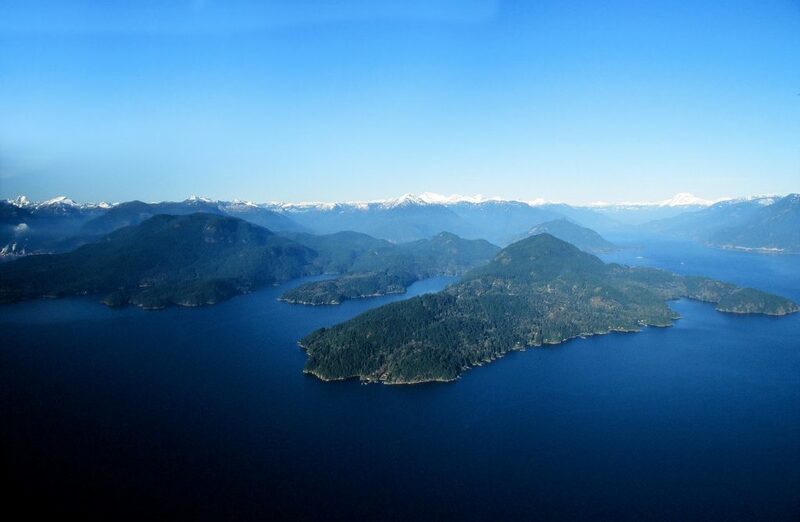 Howe Sound is the study area for a comprehensive assessment that estimates the total annual value of intact ecosystems at between $793 million and $4.7 billion. Add marine values to the B.C. cumulative effects assessment that is underway for Howe Sound. Support jurisdictions that want to work together to develop comprehensive land and marine use plans cooperatively. Implement a trust fund from development proceeds to fund environmental mitigation and remediation. Plan for construction of key facilities and infrastructure to occupy previously developed shoreline, if feasible. Collate and make available pre-proposal data from environmental and social research. Make sharing of these data mandatory. Develop targets for ecosystem health, goals for sustainability indicators, and limits for environmental impacts.